1936 - July 15 - Centered around Milton-Freewater. Shallow. Most destructive quake east of the Cascades. Magnitude 5.8 with a modified Mercalli of VII. Windows broke, walls cracked, a few chimneys collapsed, a two-story concrete house near Umapine lost part of the top of its second story. 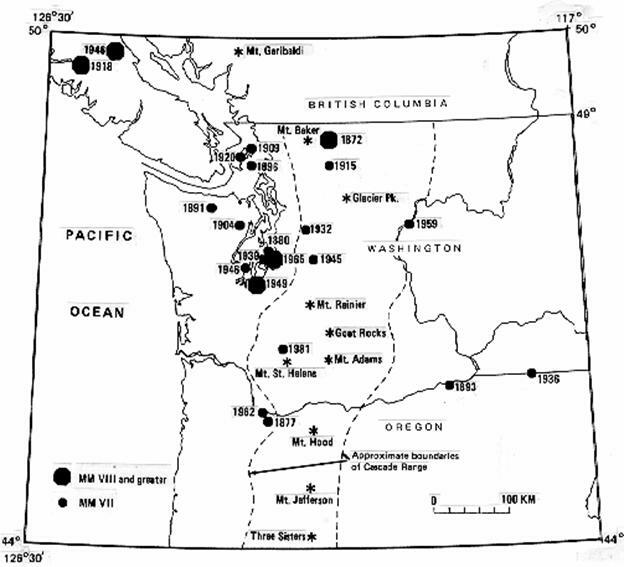 Numerous aftershocks reported through late November 1936. 1939 - November 12 - Centered in south Puget Sound. Deep. Chimney and plaster damage. Magnitude 5.8 with a modified Mercalli of VII. 1949 - April 13 - Centered on Olympia. Deep (30-40 miles). Magnitude 7.1 with a modified Mercalli of VIII. Substantial damage to masonry buildings with inferior mortar. Differential ground movement. Most damage in Seattle was concentrated in areas of filled ground around Pioneer Square area, where many older masonry buildings suffered. Washington schools sustained a disproportionately high level of damage. Thirty schools, normally serving 10,000 students, were damaged. Ten condemned and permanently closed. 1965 - April 29 - Centered just south of Seattle. Deep (30-40 miles). Magnitude 6.5 with a modified Mercalli of VIII. Similar damages to 1949 earthquake. Eight Seattle schools, normally serving 8,000 students were closed until safety inspection could be carried out. 2001 - February 28 Centered at Nisqually delta. Deep (30-40 miles). Magnitude 6.8. Similar damages to 1949 and 1965 earthquake. For additional information on earthquakes in the Pacific Northwest see this web site. 1877 - October 12 Shallow. Centered in the Cascade Mountains. Magnitude 5.3 with a modified Mercalli of VII. Chimneys damaged in the Portland area. 1892 - February 3 Modified Mercalli of VI. Buildings swayed, and terrified people rushed into the street. The earthquake was felt strongly at Astoria and Salem; the total area affected covered about 10,000 square miles (26,000 square kilometers). 1893 - March 6 Shallow. Magnitude 4.7 with a modified Mercalli of VII. Some damage to buildings at Umatilla. Details on this shock are lacking. 1920 - April 14 Centered in the vicinity of Crater Lake. Modified Mercalli of V. Three shocks were felt at Fort Klamath. 1920s - Earthquakes were felt near Cascadia, February 25, 1921 (V); southern Oregon, January 10, 1923 (V); eastern Baker County, April 8, 1927 (V); was noticed at Halfway and Richland. 1940 - 1968 - Earthquakes were felt in the vicinity of Portland, December 29, 1941 Magnitude 5 (VI); Portland, December 15, 1953, Magnitude 5 (VI); Salem, November 16, 1957 Magnitude 5 (VI); Albany and Lebanon, August 18, 1961, Magnitude 4.5 (VI); Portland, November 6, 1961 Magnitude 4.7 (VI); Oregon-California border, May 26, 1968 (VI).